Yes, I am inspired and fueled every day by you. Yes, I feel it’s my mission to help you feel more acceptance, love, and authenticity. Yes, I love connecting with you and am so grateful when you connect with me. But, truly, there’d be no “we” without you. There’d be no inspiration without you. There’d be no exchange of love without you. So, before anything else, thank you for being here. For showing up in all of the ways you do with me, with “we”, and with the world. Even if I never see you, I can feel you. We can feel you. Together we are fields of nourishment and beauty. I am a drop in the ocean that hopes to create a ripple. Together we are a movement. A quirk tsunami showing up with all we’ve got. Honoring every molecule within us and within each other. There is no “we” without you. 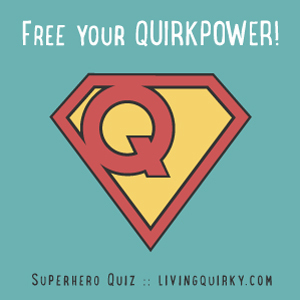 Each and every one of you is an integral part of Living Quirky. And, I am always seeking to connect deeper with you. To love and be here for you more. I feel as though Living Quirky is a toddler. It’s running around, laughing and crying and discovering itself. And, together we are raising, supporting, and loving this living, breathing organism so it can stand on its own. So it can be more than an idea in my mind, a desire in my heart, or a calling in my soul. So it can be more than any one of us individually, and exponentially more with all of us together. I don’t yet know what Living Quirky will grow up to be. All I know is my role is to love it as deeply and fully as I can. To love you for loving it as deeply and fully as you can. With love in the center, always. So… Christina, my question to you is, how do you want to love? ​What does love look like to you? Would you want to co-create and share in the becoming of Living Quirky? I know a survey can feel really impersonal, but I’ve crafted one with all of my love so I can hear YOUR perspectives of love. Please excuse the platform, it is meant to be a simple tool for us to connect. You are also welcome to just reply to this email. I always read each and every message. I’d love to hear from you –> Click here for a few fun, loving questions!